Most of the soil physiochemical properties are inherited from their parent materials. However, some of them are influenced by the management practices. These properties are of great importance for both land use and management activities in precision farming. Soils in Bahariya Oasis have a wide variability in their parent material, which is reflected on their physiochemical properties. 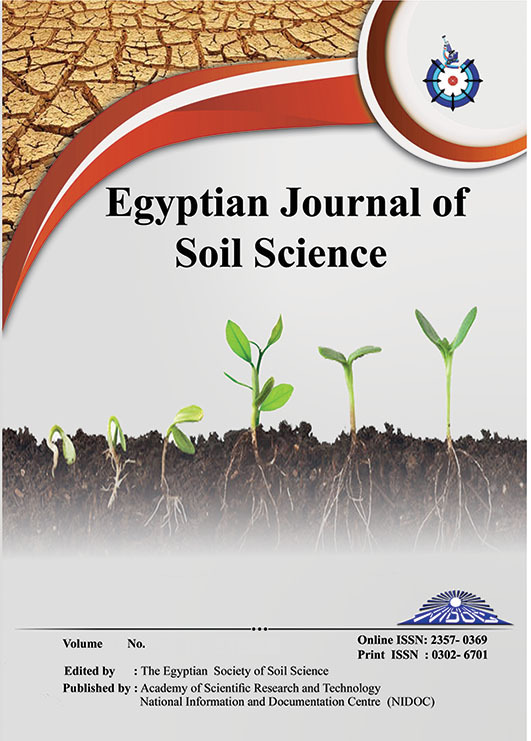 The objectives of this work were to study soil physiochemical properties in Bahariya Oasis and their spatial distribution in light of soil pedology. The obtained results indicated that the majority of soils in Bahariya Oasis are sandy, which had a very significant impact on their physical and chemical properties. The values of organic matter and soil porosity were low, whereas the values of bulk density, hydraulic conductivity, and mean pore diameter were relatively high. On the other hand, the CEC values were low in most of the studied soils and the ESP values were less than 15% in all soils. Most of soils in the oasis are highly saline. The availability of NPK in Bahariya Oasis varied from low to high and the C/N ratio was less than 25 in the studied soils. Also, highly significant correlations were observed among soil physical and chemical properties in the Oasis. In conclusion, soil physiochemical properties in Bahariya Oasis were highly influenced by their pedology.